The human leukocyte antigen f-associated transcript 10 (FAT10) has a similar structure and function with ubiquitin, which efficiently mediate proteasome degradation in an ubiquitin-independent manner. FAT10 expression is upregulated in many tumor tissues and plays a vital role in cell cycle regulation and tumor genesis. However, its role in glioma has not been illuminated. The aim of this study was to evaluate the prognostic value of FAT10 and investigate its functional roles in glioma. The expression of FAT10 in glioma patient samples was examined using quantitative real-time reverse-transcriptase polymerase chain reaction (qRT-PCR), Western blotting and immunohistochemistry methods. Glioma cell lines with either FAT10 overexpression or knockdown were created. The effect of FAT10 on glioma cell migration and invasion was investigated using these cells. In the present study, we had shown that FAT10 was elevated significantly in glioma samples and correlated with tumor pathological grade. FAT10 high-expression glioma is associated with a poor clinical prognosis. Overexpression of FAT10 promoted proliferation, invasion, migration, and sphere formation of glioma cells, whereas downregulation of FAT10 had an opposite effect. Overexpression of FAT10 also promoted the growth of glioma cells in vivo. 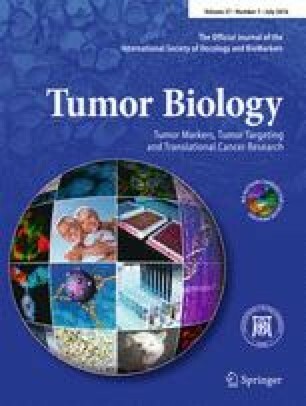 Moreover, FAT10 enhanced the phosphorylation of Smad2, which contributes to FAT10-induced oncogenic activities in glioma. In conclusion, these findings indicate that FAT10 is a critical regulator potential therapeutic target of glioma. The online version of this article (doi: 10.1007/s13277-015-4739-6) contains supplementary material, which is available to authorized users. This work was supported by the National Key Technology Research and Development Program of the Ministry of Science and Technology of China (2013BAI09B03). All patients gave informed consent for the analyses to be undertaken, and the study protocol was approved by the Ethical Committee of the coordinating center, the Capital Medical University (Decision no. CMU-201409). Animal handling and research protocols were approved by the Animal Care and Use Ethnic Committee of Capital Medical University, Beijing China (Decision no. CMU-201410).